Tuesday, November 17, 2015 – During our conversation on a unseasonably warm afternoon, Yousif Dawud casually shakes a tree, which lets loose a handful of pears. He picks them up, washes them with a nearby hose, and takes a bite out of the ripest one. As he walks on, he points out the other fruit trees and plant species that have been successfully grown at Socrates Sculpture Park. Looking around at the lush greenery that adorns the park’s pathways, it becomes difficult to believe that when the park was founded, it was a landfill and dumping site. When asked if he has a favorite plant, Yousif replies, “I can’t say only one, that would be unfair!” However, he later confesses to liking Japanese Maple trees just a smidgen more than he does other types of plants. As the site’s resident horticulturist, Yousif has been bringing gardens and groves to the park since 2005. He works with Socrates through Plant Specialists, a Long Island City-based company that designs, maintains, and installs indoor and outdoor gardens. The landscaping company has played a critical role in developing and supporting the park’s Community Works Initiative, a program that engages local residents in employment and job training in the areas of landscaping and horticulture. Plant Specialists has also donated the majority of the plants and trees that are found throughout park premises. 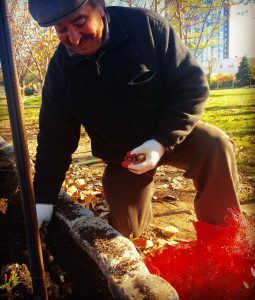 Today Yousif is planting 500 daffodil bulbs the park received from the NYC Parks Department as part of New Yorkers for Parks’ annual Daffodil Project. These efforts will be largely unnoticed until early spring, when hundreds of daffodils will bloom and bring the season’s first blast of color to the park’s gardens. In Jordan, Yousif received a Bachelor’s degree in agriculture, and when he came to the U.S., he originally settled in Mississippi to study for a Master’s degree, but relocated to New York not long after. “Life was too boring there,” he says, now in his 38th year in New York City. He lives in Queens with his wife, and his two children are now in their early twenties. At home, Yousef doesn’t garden, since living in an apartment in the city makes tending to plants a difficult task to accomplish. At the park, however, Yousif is constantly caring for the greenery that is flourishing. Every spring around Earth Day, Socrates welcomes students from the Baccalaureate School for Global Education to the park for a day of spring cleaning, preparing the park for a new season. Students dig, plant, mulch, water, clean, and beautify the park, with Yousif as a resource for advice, tips, training. He feels that it is important for young kids to learn the value and importance of environmental awareness and garden maintenance.